Mother’s new religious zeal was fine with me. I loved Sunday school, the stories the teacher told with illustrations on the felt board, and singing, and just the whole feeling. I was reading the Bible (in bits and pieces), and God was taking care of us now for sure! Because of my grandmother’s constant presence in the background of my life, and despite my mother’s hedonistic lifestyle, I was brought up in a very Christian environment. My great-grandfather, Rev. 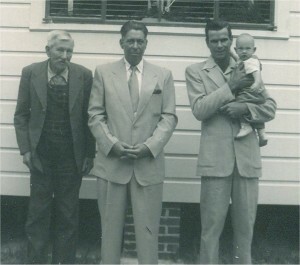 S. G. Meadows, at left with his son, my grandfather, and my uncle and cousin. Four generations of Meadows Men. This is how I remember my great grandfather; I was born two months after this photo; he died 7 years after this photo was taken. I was impressed! I was unaware, of course, that this remark concerned little children in general, and not my own state of spirituality. But, I took it to heart and vowed to strive to make it true. The questions raised in my mind by the Face at the Window drove me to discover a haven of safety “in the arms of God”. My quest became to find God. I felt the Hound of Hell at my heels. Our experiences of Mother’s manipulations and self-centered behavior damaged our sense of security. My internal operating system demanded a source of stability, and God was the logical choice. I was avid in my Sunday school studies and devoted in my prayer life. I spent many hours writing songs and prayers and decorating them with drawings of vines and flowers, tucking them here and there for God to “find” them. But early on I became aware of contradictions and discrepancies in “Standard Religion”. The anomalous events of my life were inexplicable. I constantly prayed for guidance and support. 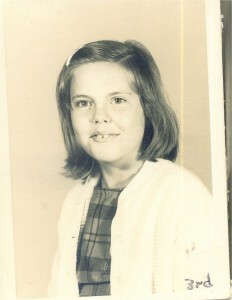 School picture taken in the fall of 1960. At the same time I was keenly aware of pain and suffering all over the world, and it seemed I was cursed with the burden of acutely “tuning in” to this cosmic pain. I could “sense” the sorrows of people behind their words. This was distressing, because what was inside them seldom matched their words or expectations. Someone said, “Oh, I’m fine!” and I could tell clearly that they were not. Someone talked happily about their plans, and I felt a sudden heavy sensation of gloom. At times this feeling of gloom had presaged tragedy in their lives. I suffered with every starving child, every grieving parent and pain racked victim. I prayed constantly for the world’s pain to be ameliorated because I needed my own pain to end. But everywhere I looked, there was suffering now, or suffering to come. In retrospect, I wish this profound empathy had extended to “reading” those with negative intentions. But whatever the source of this ability, I was denied a useful, self-protective application and manifested one that was crippling. I could perceive the pain of the disenfranchised soul, but I could not read the thoughts of the mind. I believed in the literal truth of all we were taught in Sunday school. All my life I heard about God talking to people, bringing revelations, answering prayers. When anyone said: “I prayed about it and God showed me,” I believed that God had really spoken audibly, or had produced a real, visual image, or some other equally miraculous event of guidance. And this led to a problem: why, if I prayed to God and waited in silence for an answer, I never heard one. If God wasn’t answering, there must be a reason. I asked the Sunday school teacher. The reply concerned “original sin”. I was told that if I had faith I could overcome this sin, and Jesus would save me and God would most definitely answer my prayers. But what is this thing called Faith? I was told this meant “belief in God”. Well, heck, I had a lot of that! No problem! I kept praying to a God in whom I believed literally and completely, but I still received no answers. And no changes in the situations I was praying about. I asked God to explain why he wasn’t giving the help I needed. Why did God speak to everybody else and not to me? Clearly it was because of the Face at the Window. I was contaminated in some way. I was bad. That’s why my father didn’t want me. That’s why Mother couldn’t keep a husband. Somehow they always found out a darkness existed because of me. But I didn’t want to be in darkness! I loved God! And I needed God to tell me how to make the Face at the Window go away forever. Then God would know I loved him, and he would love me too. Since God seemed to be hiding, I determined to find out how to get to Him! Finding contact with God became my overweening goal. He was, after all, my Father too, wasn’t he? Didn’t I have a right to his love and attention like all others who claimed to have a hot-line to heaven? Did I need to pray more? Sacrifice something I liked? I would willingly give up what little I had just to feel the touch of God’s breath on my cheek. How about just a little, teensy, tiny sign to assure me that YOU exist? Something to hold onto? A straw, for God’s sake! I am drowning here! But God never answered me. Then I began to wet my bed at night. This mortally embarrassed me. Not drinking a single drop of water from about three in the afternoon didn’t work. All the folk remedies my grandmother came up with didn’t work. The instant I fell asleep signaled my bladder to let go. On cold nights, I woke up immediately, wet and freezing and miserable. I didn’t know, of course, and neither did anyone else, that this was one of the early symptoms of the autoimmune disorder that would almost destroy me. At my grandparents’ house I slept in one bed with my mother, and Tommy had his own bed in the same room. My mother’s solution to my lack of nightly bladder control was to lie awake until I was asleep. The instant she felt wetness spreading, she’d start slapping me to wake me up in a state of pain and shock. I spent many nights trying to stay awake so that wouldn’t happen. Soon, not surprisingly, Mother met a nice elderly widower at church, a successful businessman named Ed who traveled a great deal. He had a teenage son and the appearance of a kindly and devout father figure just waiting to enfold us all in his loving embrace. Early summer of 1961 around the time of my mother's marriage. 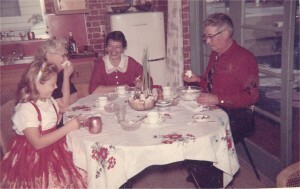 We had been told we would be sent away to school in the autumn and here, I am with my grandparents visiting a family friend. All Mother’s new church friends favored her marriage to Ed, so she launched into an exciting time of shopping and preparing for a “real” church wedding. But Tommy and I were excluded. The children of the bride were not invited to be members of the wedding party. We were not even allowed to attend the ceremony. As soon as the honeymoon was over, we were informed that we would soon be sent away to a boarding school in the Carolinas. Mother assured us that boarding school was a favorable opportunity. Only children of rich families could attend. In later years, I discovered the new stepfather was actually a conniving cheapskate. Ed used his connections in the church to get us accepted to a school primarily set up for missionaries’ children unable to accompany their parents to wild and forbidding posts among the heathen in deepest, darkest Africa or wherever. It was, in short, a “charitable institution”. Talk about your basic Jane Eyre drama! In all fairness, I can’t say that anyone at the school was harsh or cruel to us. It was a lovely school in a beautiful location, with excellent staff. But I was a nine year old girl separated from my family and especially my brother, who’d been my hero and constant companion. I was left in the care of strangers unable to give special attention to one child of 24 in their charge. School discipline was modeled on military basic training sans the exercise routines and drills. We did everything by the clock and marched everywhere in straight lines. Boys were separated from girls. I saw my brother only on occasion and at a distance. This was a cruel separation for me. Tommy had been the only constant I was able to trust with any degree of certainty. And now, even the small sense of security that he’d be there the next morning was lost. Little girls who see faces at the window need a lot of protection. 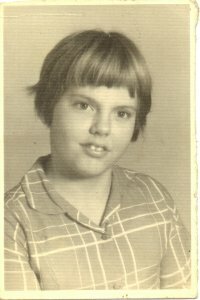 This is the school picture taken right after school officials ordered my hair cut. As you can imagine from the previous photo taken in early summer, by autumn, it had grown quite long. I was not to receive it. Immediately I was shorn of my long hair. I couldn’t take care of it alone and no one had time to help, so it had to go. I wept as the teenage girl assigned to the job sliced through my hair with heavy scissors, joking all the while that my hair was so thick it was like a horse’s tail. I was still a child who cried at night clutching a toy bear. And wetting my bed, of course, made me the brunt of many cruel remarks. Once a month we marched down the mountain in double rows to the little movie house in town. We paid a nickel to see the latest amours of Elvis Presley. Older girls wore poodle skirts and saddle shoes. “The Lion Sleeps Tonight” was soon to be their number one song. And the word “voice” reaches for that lovely E flat. The choir director stopped waving his wand and stared at me in surprise. I didn’t realize I’d given so much power to the hymn that I could be heard above the choir. I lowered my voice and warbled on with the other girls. I stopped singing in the choir after that, even though I received many messages that I was missed and would I please come to practice. It didn’t occur to me that I had a pleasant voice. No one had ever said so. Mother had given me attention only when I did something wrong. Naturally, my demon problem went with me to school. The feeling grew that I’d been sent to this place because other people, especially my mother, could sense in me some contamination, the same way I could sense the pain behind their words. I was a person to be shunned and sent away from the family. Perhaps my mother’s marriage would work for the very reason that I was not present. I kept my eye on the window in my room and cried bitterly for God to rescue me from my utter aloneness. But God wasn’t talking. Mother and the new stepfather were traveling at Christmas time and weren’t coming to see us. It seemed, for a time, that we would be the only two kids still at school over the holidays. All the others were making happy preparations to go home to celebrate. So my Grandfather put Tommy and me on a bus to Tampa, traveling by ourselves for the first time in our lives. When our two-week vacation was over, Grandma packed our suitcases with care and precision, tucking in small gifts and goodies. I cried miserably, dreading the return to school. Grandpa promised us if we could stick it out till the end of term, he’d see that we didn’t have to go back again. I think Grandpa was already getting a clue about this “good Christian” my mother had married. He definitely wasn’t pleased to see us so unhappy. Back at school, my tenth birthday was approaching. I felt depressed because there would be no cake, no ice cream, no gifts, nothing but just another winter day. Sure, I would get a card with money in it from my mother, and maybe the same thing from my grandparents, and later, the housemother would probably take me to Asheville to spend my birthday money on new clothes. I was growing out of the wardrobe I’d brought to school. My knees stuck out below my dresses, the waistlines hung halfway to my armpits, and several inches showed between the cuffs of my sweaters and my wrists. I felt gangly and badly turned-out. I was sitting morosely in the common room on my birthday night, reading a book. It was snowing outside. I doubted we would have classes the next morning. It would be too treacherous to venture down the mountain. A knock came at the door and one of the girls went to answer it. The wind blew in, the snow swirled across the polished floor, and someone called my name. Standing there in the doorway, with the stepfather behind her, wrapped in a magnificent coat, wearing elegant fur-topped boots, was my beautiful mother. And oh! How much at that moment I loved her! How happy I was to see her! I was not forgotten! I was loved! She had come! But only for a few hours. She’d persuaded the stepfather to go a little out of their way to stop by the school. She told me later that Ed complained this would put him off his travel schedule, but she’d threatened that if he didn’t take her to see her children, she’d find her own way there and he could travel on alone. Nothing and nobody could stop her from seeing her children! Mother had already spent a couple of hours with my brother, and now we had a little time together before they had to leave. They were on their way back to Florida to stay, Mother said. When we finished the term, we would come home to a new house, and we would all be happy together. It sounded too good to be true, but I held on to the hope. I was so happy to be held by my mother that nothing else mattered. I was safe, I was loved, I was wanted, and God had answered my prayers. Maybe he hadn’t spoken to me, but everything was going to be fine now. She hadn’t brought me a birthday present, but she gave me her fur-topped boots to keep my feet warm. I had outgrown my own. And, since she was returning to Florida, where she wouldn’t need them, she also gave me her sweaters, her snow suit and her heavy coat. I was so proud to wear my mother’s boots, coat and sweaters, even if they fit badly. It was proof she loved me. The mysterious events after this hit and run visit could reasonably be attributed to emotional and psychic trauma. God only knows I have thought it all over many times, trying to plumb the depths of meaning that may lie hidden in symbols of memory so easily distorted. I remember waking up one night and seeing a bright light outside shining in through the window. The residence I lived in was built high on a cutaway flat place on the side of a mountain. There was less than 15 feet between the back of the building and the vertical slope that went up about 30 to 50 feet. The driveway provided just enough room for the housemother to park her car and have room for passengers to get out on either side. The only way a light could shine in the window would be if the back lights of the building were on, or if someone were standing on the drive with a strong light. I figured that it was the former, disregarding the fact that the building lights were off to the side and didn’t shine in my window when they were on. With that explanation, I dismissed any other and went back to sleep. Whatever it was, it didn’t seem to concern me. The next thing I knew, I woke up with my body on fire. I was so hot that I couldn’t breathe. I threw off my covers and thought about all that nice snow outside that was so very cool. I got up and went to the window, a tall affair much like French doors, opened it and stepped outside. I walked in my bare feet along the back of the building, past the housemother’s car, to a place where the snow was piled up nice and deep. When I lay down it felt like a cool feather bed. And that is the last I remember until I woke up shivering and shaking in my bed. The housemother went from room to room turning on all the lights (the usual morning procedure) and singing out “rise and shine!” into every room. I knew I didn’t feel quite right, but I must have been too young to realize there was something very wrong. I had seldom been sick in my life. I struggled through the process of dressing myself, pulling on two layers of clothing, working my way into my snowsuit and boots. In a daze, I followed the other girls in the darkness, down the side of the mountain to the dining hall. I slowly took off my snowsuit, hanging it on my peg in the foyer with all the other students milling around and hanging their snow gear up, too. When I entered the dining hall, the brightness of the lights and clatter of dishes and voices was shocking and seemed completely foreign. I found my way to the assigned table and sat down like an automaton, unable to lift my head or look at anyone until the table monitor began to pile food on my plate, encouraging me to “eat up!” I looked around at tables crowded with people enjoying the wonderful breakfast the school provided so generously. I didn’t recognize a single thing. I looked back at my plate, piled with eggs and bacon and hot buttered biscuits, and wondered what I was supposed to do with all this food. The voices at my own table had fallen quiet. Everyone was staring at me. I took my hand out of my lap, picked up my fork, and took a small bite of egg. The instant I did, I experienced a sensation that can only be compared to being hit in the stomach by a sledge hammer. As though I were watching from a distance, I saw my body go into a convulsion and fall from the chair onto the floor. It was heaving and vomiting like an animal struck by a car. Chairs were thrown back as several people gathered around me, watching helplessly as my body convulsed and emptied itself with such violence that I thought my eyes would be ejected from their sockets. Finally someone helped me to my feet, wiped my face, and asked if I was going to be okay. Reminds me of the joke about the guy who falls from a tenth story window. He’s lying in the street with every bone in his body broken. A passerby runs up and asks: Are you hurt? Well, what do you think? Was I okay? Well, heck, I wasn’t even connected to that body, so naturally I said “yes”. At this point, the clean-up crew arrived. I knew I’d be required to clean up the embarrassing mess I had made, so I tried to take the mop, but they told me to let someone else handle it because I needed to go to the infirmary. I said that I just needed air. I couldn’t breathe in that heat and light and noise. I made my way to the foyer and struggled into my snowsuit in the semi-darkness. No one came to see if I was managing. I seemed to be forgotten. I opened the door and went out into the snow. It was barely daylight outside. I don’t remember walking to the infirmary. But then I was aware of the sharp smells of Lysol and rubbing alcohol as I collapsed just inside the door. I remember waking up at odd times of the day or night with so much pain in my head that I immediately went unconscious again. I drifted in and out for days. Finally, the intense, blinding pain was gone, and I awakened to a dull throbbing and the feeling of warm wetness all around my face and in my hair. I lifted up my head to see my pillow soaked with blood. A nurse washed my face and cleaned the side of my head where blood and fluids were draining from my ear. She changed the pillow and gave me something sweet to drink in a little paper cup. I was so exhausted I immediately went back to sleep. Days passed this way. One morning I woke so early that the sun had not yet come up from behind the mountain. The light was clear, but muted. And everything was in black and white. I felt something unusual about the way the light appeared in the high windows of the infirmary, so I got out of the hospital bed, crossed the room to the windows against the far wall, and climbed onto an empty bed to look outside. The world had been transformed. It must have been snowing for a long time because it was deeper than anything this Florida girl had ever seen, and we had already had a lot of snow that year! All the leafless shrubs wore fluffy hats, like little clouds scattered here and there. Across the way the trees in the apple orchard looked like they were connecting puffy little clouds to the bigger one on the ground. There was one glorious tree centered directly opposite the window, so perfect in proportion and shape that I could only stare fixedly at it with a certain sense of an inner meaning to such perfection. There was not a mark or a track or sign of any living thing anywhere. The entire world, as far as my eye could see, was clean and white. It was like waking up in the clouds. I couldn’t stop looking, as if hypnotized by the scene. And as I gazed in breathless wonder at this amazing display, it began to transform before my eyes. The sun emerged behind the distant mountain, and golden rays of light were probing and feeling their way through the tops of the trees, gradually moving down the trunks to the ground. This living light turned what formerly looked like puffy clouds to masses of glistening gold and silver, with sparkling diamonds studded everywhere. With the slow, but detectable movement of the sun, the earth came alive with light, sparking like electricity, dancing and leaping in rainbow colors. I don’t know how long I stood there. The spell was broken when a bird hidden in the branches of the tree suddenly took flight, scattering snow illuminated by the rays of the sun like a halo in the air drifting slowly to the ground. I forgot pain and suffering and the misery of the past weeks, and felt a surge of longing to dress and go outside and dash around and explore this magical landscape. The resilience of childhood, hope for a better world, a new adventure, and life itself was alive and well inside me. This time, the Face at the Window was mine.